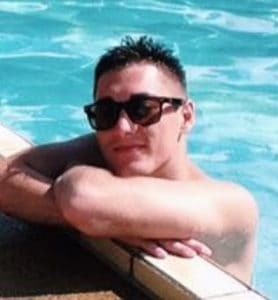 When summer hits in full force, the sun can quickly become unbearable, making it too hot to enjoy a relaxing swim or an afternoon spent poolside. But instead of hiding inside during the heat of the day, a pool umbrella can give you the shade you need to enjoy your pool. Read on to discover the different options you have to create a shady spot by your pool and our recommendation for the best pool umbrella. Why Do You Need a Pool Umbrella? Pool umbrellas are a fantastic addition to the décor surrounding your pool, as they allow you to create the shade you need, precisely when and where you need it most. But not only this, pool umbrellas provide a level of privacy from your neighbors, screening your pool from any prying eyes so you can relax in comfort. Most pool umbrellas are completely freestanding and do not require a fixed installation, though you may need to purchase a separate weighted base in addition to the umbrella to ensure it stays in place. 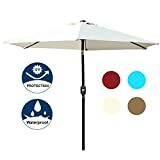 What Types of Pool Umbrella Can You Buy? A market umbrella is a particular style and is also known as the patio or café umbrella, as this is where you’re most likely to find them. Featuring a straight pole that inserts at the middle of the umbrella, these types often have tilt adjustments and a crank mechanism so you can quickly and effectively set them up. You may also notice wind vents in the fabric of the umbrella, which help to ensure your umbrella is not damaged or blown away when the wind picks up. Instead of a center pole, cantilever offset umbrellas utilize a hanging design with the pole set off to one side, and the umbrella hanging down to provide shade. These types of umbrellas are great if you’re trying to create shade in an awkward position, like around a patio table that doesn’t have a hole for an umbrella or to set it up to shade a particular section of your pool. 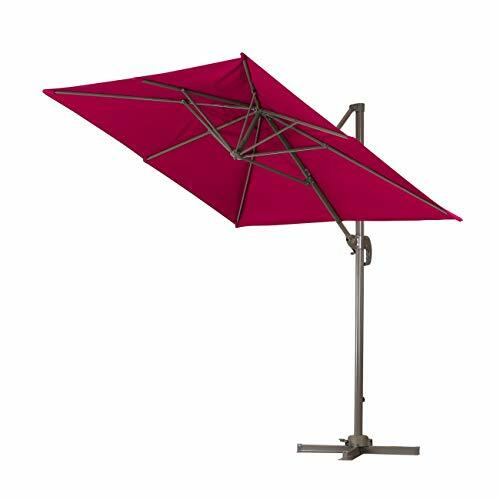 The cantilever function allows you to tilt the position of the umbrella to many different angles, ensuring you’re always able to create shade, no matter where the sun is. Market vs. Offset Umbrella: Which is Best? Market umbrellas are stable, but a little restrictive in where they can be placed as the weighted base needs to be right in the center of the umbrella pole. Offset umbrellas remove this restrictive feature, but it’s at a sacrifice to stability. They also allow you to lower the height of the umbrella as you need, a feature not often seen in market umbrellas. Personally, I’m a fan of the offset umbrella design, it’s a little more stylish around my pool, and the umbrellas are a bit more versatile in where they can be placed because the base isn’t right in the middle of the umbrella. 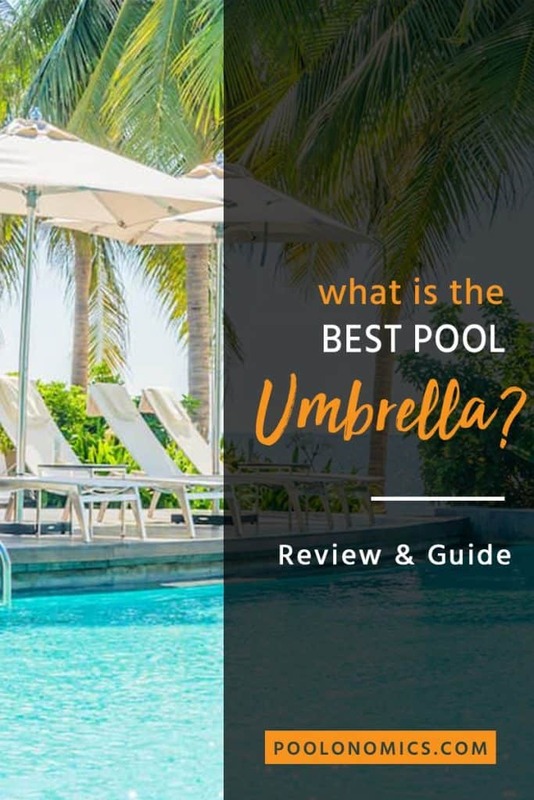 Let’s go over some of the main criteria you should apply to your decision making process when looking for the pool umbrella. You can find pool umbrellas in a variety of different sizes, and it’s essential you choose the right size for the particular area you plan to use it in. Too small and you won’t get adequate cover from the sun. Too large and you’ll have a massive and unwieldy umbrella that’s a pain to set up when you need it. If you’re wanting to cover a patio table or some deck chairs, first measure the area you wish to be shaded, then add another 2 feet on either side. That’s the size of the umbrella you need. Is It The Right Material/Fabric? Because your pool umbrella is out in the elements, you’ll need a strong and durable construction. Not in just the umbrella pole and ribs, but also the fabric of the umbrella itself. You’ll want an umbrella with either powder coated aluminum or steel ribs, a UV and water resistant fabric, and one that’s thick enough to stand up to the elements following season after season of use. It’s important to mention most umbrellas are not designed to handle strong, stormy winds, so you should avoid keeping them out and exposed in extreme weather. Generally, a pool umbrella will last from one to several seasons, depending on the quality of the product you’ve bought. Does It Have a Suitable Lifting Mechanism? The mechanics to open and close the umbrella are usually one of three different types. The simplest is the pulley, as you use a little muscle to pull the rope down then lock it into place with a pin. Push up options usually have a center handle that is also secured into place with a pin. Finally, you have the crank. A simple handle you can wind open and closed, which is also locked into place once your umbrella hits the desired position. Does It Have a Suitable Tilting Mechanism? You want a tilting mechanism inside your pool umbrella as this allows you to change the angle of the umbrella to provide the best shade at any time of the day. This particular element looks a little like a knee on your umbrella pole, and the most common mechanism is a push-button tilt. Press the button, and the lock opens, allowing you to reposition the pole at the angle you need. The collar mechanism is similar, but instead of a button, it’s a sleeve, that needs to be lifted up for the lock to free and change the angle of the pole. Crank mechanisms are the easiest to operate, as you merely need to keep turning the crank once the umbrella is fully open to reach the level of tilt you would like. Do You Need Specific Features? Finally, it’s important to think about any additional features you need for your pool umbrella. For most people, a weighted stand is an important consideration as most manufacturers will sell this separately to the umbrella. You need this to keep your umbrella in place. A cover may also be a good idea if you’re in an area with particularly harsh sun, as this will limit the exposure to the elements and make your umbrella last longer. And you even have options like solar power connectivity and LED lighting systems that come in some pool umbrellas to help you maximize your time spent poolside. So far we’ve covered why you need a pool umbrella, the different types available, and what features are important to focus on. In this section, we’ll be looking at specific umbrellas, each of which were hand-picked for review based on the same criteria I’ve outlined in this guide. 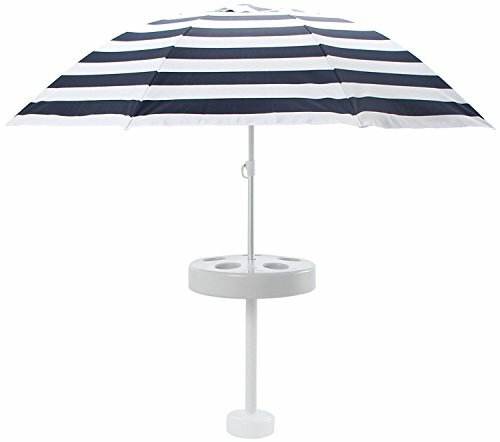 Designed by Abba Patio, this is a market table umbrella with a 9-foot diameter, capable of shading two pool chairs or an outdoor 4-6 seat patio table. What I like best is the fabric, it’s been treated to be both water resistant and provide 1,000 hours of UV colorfastness. The only downside is the quality, some users experienced problems with the crank mechanism failing, or the poles bending. 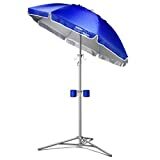 Designed by Wondershade, this is a portable and lightweight sunshade, with a 60″ diameter, that blocks 98% of UV rays from getting through to you underneath. As a highly portable shade option, you can assemble this sun shade in just 60 seconds, making it perfect for any outdoor event. What I like best is the convenience. Not only does it come with a built-in sand screw (making it easy to set up at the beach), the hanging hooks help you keep your belongings up and off of the ground. The biggest downside is the quality, many users experienced this particular product falling apart after using it just a handful of times. This is my top pick for the best pool umbrella. Designed by Blissun, this is a patio umbrella with a 7.5-foot radius, capable of shading up to a 36″ table with 98% UV protection. 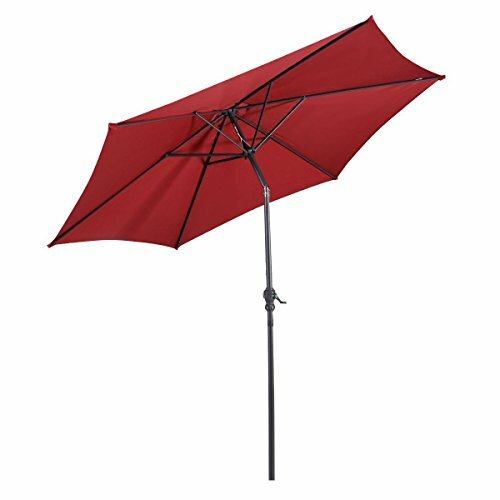 Featuring an easy to use crank handle and a one-button push to tilt the umbrella, the air vented canopy helps the umbrella stand up to the wind. What I like best about this product is just how solid it feels. Lightweight yet highly durable, even the canvas is excellent quality. The only downside is the mechanics, some users have had problems with the tilt mechanism failing after heavy use. This is my runner up for the best pool umbrella. 98% UV protection from the harsh rays of the sun. 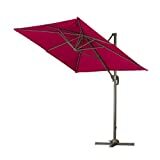 Featuring a powder coated steel frame with a bronze finish, it comes with a cross base though you will need to purchase the weights separately to keep the umbrella in place. 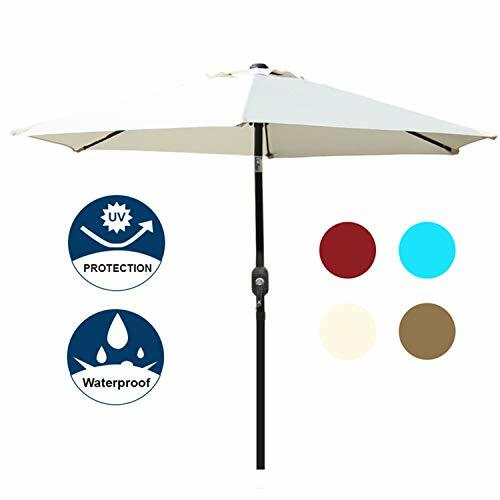 What I like best is this particular umbrella has 6 different positions, so you’ll always be able to create a shady spot, no matter where the sun is. Just be wary of the products being damaged in shipping, many users faced this problem, and the pre-drilled holes for assembly don’t always match up. You may need to drill these out yourself. Designed by Giantex, this is a patio umbrella with a 10-foot diameter, constructed from breathable fabric that is UV and water resistant. Featuring a range of different tilt settings to help you block the sun at all angles, the hand-powered crank makes for a quick and hassle-free setup when using this umbrella. What I like best about this particular product is the value for money. It’s heavy-duty and constructed from thick fabric, though some people have found it struggles to stand and remain stable on its own, and the color washes out fast. Designed by Shade Science, this particular umbrella is a free-floating setup, that can be used in chlorine and saltwater swimming pools, as well as lakes, rivers, and the ocean. Featuring a 5’7″ diameter when fully extended, it works much like the sail on a sailboat, the counterweight at the bottom keeps the table stable and the umbrella in place in the water. What I like best is that you can float this umbrella with you, anywhere in your pool, and take the shade with you. The only downside is the stability, it can be a little wobbly, and the counterweight is often not enough to keep the umbrella upright. Investing in a pool umbrella is a smart choice, as it gives you a way to stay shaded and fresh, no matter how hot the heat of the day gets, while also adding another level of privacy as you’re out enjoying your pool. Do yourself a favor, get yourself a pool umbrella today.